Melt the candy melts in a small, microwave-safe bowl with deep sides. Dip the top 1/2-inch of a sucker stick into the yellow candy melt. Press a marshmallow onto the sucker stick. Dip a Jujube candy into the yellow candy melt, then press on top of your marshmallow. Press the bottom end of the stick into floral foam to hold it upright and allow the candy melt to harden to hold the marshmallow onto the stick. Plunge the entire marshmallow into the candy melt. Tap it carefully against the side of the bowl to drizzle any extra candy melt from the marshmallow. Return to floral foam, allow to harden and dry completely. Use edible marker to create a building buddy face. Serve and enjoy! 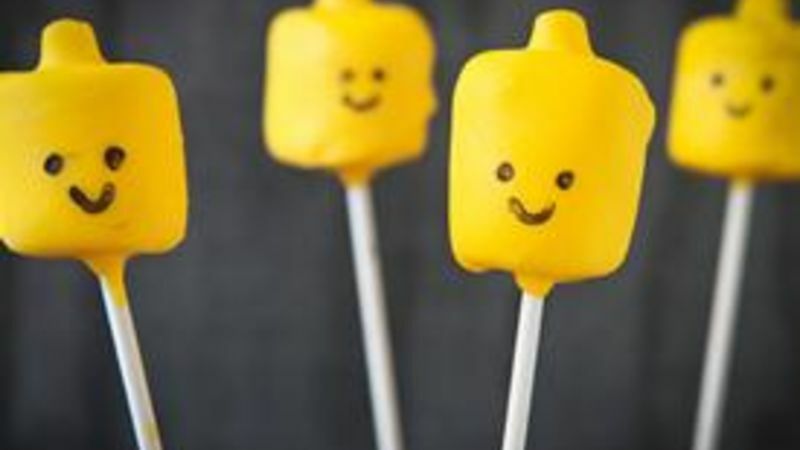 Super quick mallow pops in the shape of those crazy little Lego guys. Too fun! Create a batch of building buddies for your kids with this easy Lego Pops tutorial. This easy recipe takes just a few simple-to-find ingredients. You'll need candy melts, marshmallows, and a few yellow Jujube candies. If you're having a hard time tracking down candy melts, they can be purchased in most craft stores, in the cake baking aisle. Melt the candy melts, then dip the tip of a long sucker stick into the melted candy coating. Press that end of the sucker stick into a large marshmallow. Dip a single Jujube into the candy coating, then press it on top of the marshmallow. Press your sucker stick into a piece of floral foam to keep it upright while the candy coating cools and hardens. Once hardened, dip the marshmallow into the candy melts. Tap your sucker stick gently on the side of the bowl to get any extra candy melt to drizzle from the pop. Return it to the foam and allow it to cool completely before drawing a face on each with an edible marker (also available in the cake making aisle of most craft stores). Because kids of all ages can't seem to get enough of these treats!